Because he is so stinkin' sweet it will make your teeth hurt. Love him! This little outfit may have to be my go to baby gift for a while. Need to make a baby girl one too. 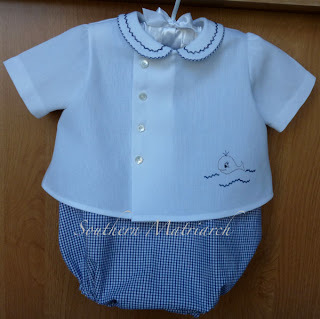 The romper underneath is out of navy checked seersucker. I really don't remember where I got it from. The diaper shirt is lined pique. 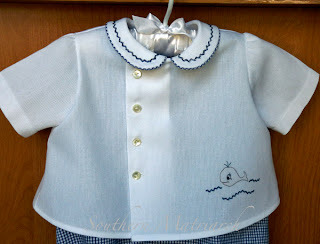 Buttons are from Old Fashioned Baby and the snaps that you can't see are Snap Source. It really is straight, I photographed it from the side a bit, the cat was in the way. I can't believe I didn't notice that bottom buttonhole that was a tad too far to the left until it was cut, the button sewed on, washed, ironed and photographed. Oh well. Chances are the new momma won't notice either. At least that is what I am telling myself. 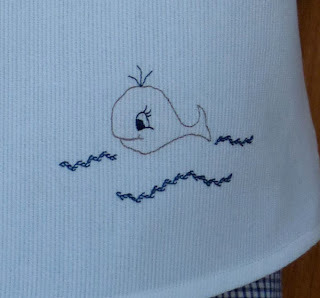 Here's another shot of that cute little whale I named Wally. I lurve him. And because that antique feather stitch is still on my radar to perfect I put it on the collar as well. Now if you enlarge this picture you can see there are some places it gets bigger, smaller, wider and then narrower, but I am okay with it. As a whole it looks okay. I will just keep working on it. It may have been foolish to do it in navy blue though, any glitches really show up. Oh well, que sera, sera! Lastly I piped the collar with the seersucker. Gingham, seersucker, and piping. How can you go wrong? No my name is not Joan Crawford but just because the chick was crazy doesn't mean she was wrong. 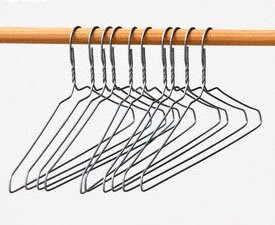 Wire hangers are manufactured for the dry cleaning industry because they are compact and cheap enough for some Sri Lankan child to produce 12,000,000 for a penny. They were never meant to live in your closets. And they sure as **** weren't meant to showcase your pretties. You work hard on your projects and you spend hard earned money on the best materials you can afford. Don't hang them, photograph them or worse yet gift them on a wire hanger. 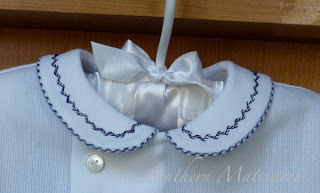 Makes me crazy to see a beautifully smocked or embroidered garment on a wire hanger. And if your budget only allows you to sew with affordably priced Imperial Batiste, that is okay. You can still go to ebay and buy yourself a dozen satin covered children's hangers for $5. How much more special will you feel to see your accomplishment hanging on a pretty hanger? And the recipient will feel like they are that much more special too. Besides, it preserves the shoulders and sleeves of the garment. Wire hangers be gone!!!! Recycle those buddies so they can find a useful purpose in life. Till next time, next up a bishop in a sweet 6-9 months size. Am deciding between two different butterfly prints. ANNNNNNNNNNNDDDDDD drum roll please, another christening gown! SQUEEEEEEE. Can't wait. 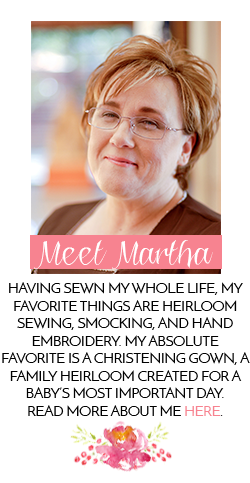 Martha, this is just darling. I think your featherstitching is lovely. Its not easy going around those curves! You are so right on the hangers. I don't even allow them in the house. Wire hangers... do not have a one in this house. Not a one. I put a ton of plastic hangers in at the lodge and will have to do so again soon. They seem to walk away. Now I mostly have wooden hangers in my closet. Love those things!! I keep thinking all of my wire hangers are gone and them one will turn up. I toss them as soon as I find one, but then there will be another one . I think they reproduce like rabbits. I buy lots of cheap plastic hangers for our everyday clothing. My daughter gave me two different size child sized forms for photographing my children's clothing. That outfit is soo sooo soooo adorable!! I love it. Your feather stitching is perfect as far as I'm concerned. Martha martha, I am loving me some Wally and some feather stitching!!! This is too cute. Can't wait to see your girl version. I am also with you on the hangers. I used to buy the padded baby ones at TJ Maxx all the time and now can never find them. Will check out ebay again!! Thanks everyone. I really like him and plan to make this outfit again for sure. I love all the close-up photographs that you have in your blog. This outfit is so cute. I'll just have to add that on to my list when this challenge is completed. I tried featherstitching for the first time this fall and boy, was that a challenge. Keep it up so you can show me! Adorable outfit. I hate the wire hangers too, and now I have another reason. This outfit is just so cute. I love it! Let the embroidery begin! and 100 posts!